Clarence Rinehart, president of the Toby Tyler Circus Collectors Club of Castor and Environs, enjoyed a weakness for slim women and big tops, so it surprised no one when he hopped onto the circus train after falling for the bearded lady, leaving his wife and young son in the Shadows. Tatiana Myshkin was her name, but she billed herself as “Tatty, the Bearded Queen of Sensual Delight,” which should have been warning enough. Maybe the title was only marketing; maybe not. Sensual delight is fine and a body’s bound to have a booming good time for a few hundred miles of track, then the train pulls into the next hamlet and you’ve worked up an appetite. When you discover that Tatty can’t cook, and realize you’ll be wanting three meals betwixt sun rise and set, the beard on your beloved seems less important after all. Sure, it makes you giggle, but three square a day works into 1200 meals a year, counting snacks. That’s a lot of bad food. No one knows what happened during the two years Clarence lived with the circus. Circus folks are mighty closed-mouthed and clanny. If you want circus scuttlebutt, you’d best talk to the elephants, as the saying goes. Me, I’d talk to the elephant that killed her. “Mr. Pachyderm,” I’d ask, “how did Tatty come to be in that particular spot when you were fixing to sit?" 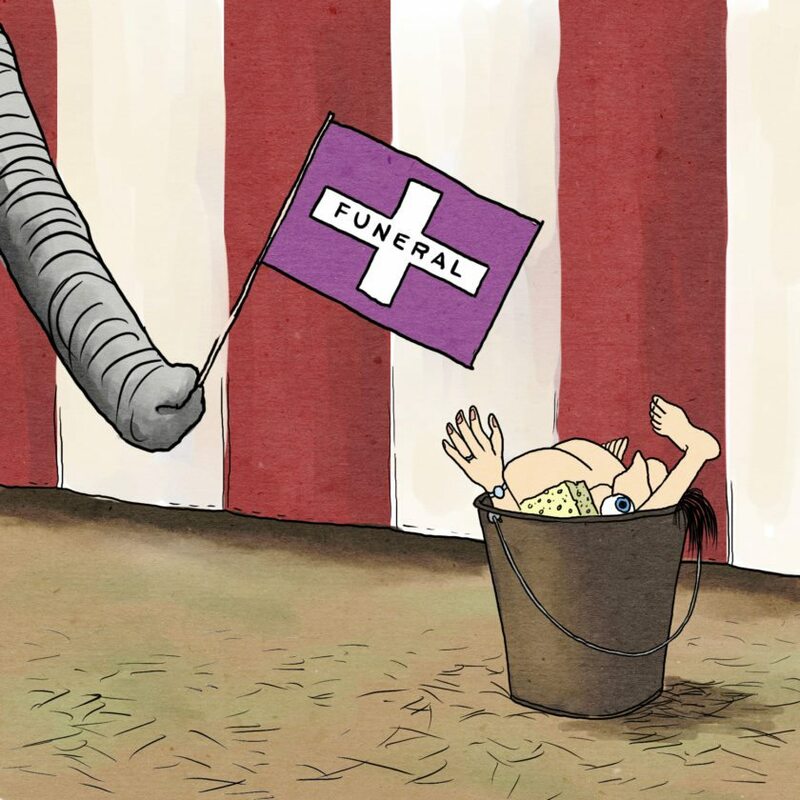 Folks said Tatty was smashed so flat that they had to wash most of her off the hindquarters, then buried her in a bucket, along with the sponges, and took the elephant to the funeral in case they missed some. The barker preached the funeral. “Step right up, folks, and take a look in the pail. See Miss Tatty, all out and over,” as the jargon goes. Clarence returned to the Shadows–what else could he do? Strolled into the kitchen one morning and sat in his chair. Didn’t say a word. Mrs. Rinehart placed his breakfast on the table and poured him a cup of coffee. “Furnace still needs fixing,” she told him. “It’ll be getting cold soon.” Clarence nodded, telling her he’d tend to it that afternoon. Tom Defoe saw Clarence walking upstream along the creek with a fishing pole in his hand not long afterward, the last time anyone saw Clarence alive. Cass Padden discovered his body in shallow water a week later. Cass said Clarence looked as pale as a mushroom and had crayfish hiding in his ears. Maybe so, but Cass didn’t find three fishing lures in the corpse. He made that up for laughs. Some folks said Clarence couldn’t live with what he’d done, that the tickling kiss of a bearded lady had been his thirty pieces of silver and the debt had to be paid in creek water. Most likely he slipped and hit his head. Does it matter? When husbands run off with bearded ladies, wives seldom take them back. Most women can’t compete with facial hair. Either way, Clarence never was handy around the house. I doubt he could have fixed the furnace.